Solicitor LL.B. (Hons), Dip. 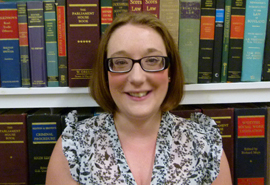 L.P.
Lesley has continued to work at Bruce Short Solicitors after completing her traineeship. She represents clients across Scotland in criminal and civil matters. She also assists in the preparation of Appeal cases. Lesley is heavily involved in immigration matters and works closely with the Immigration Team in preparing and drafting submissions for client’s human rights and asylum cases.